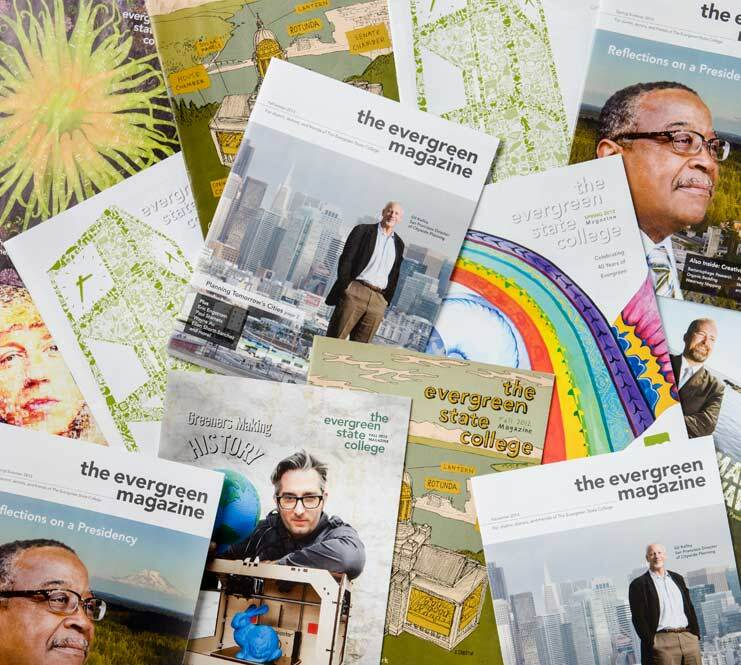 Let us know what you’ve been up to since graduating from Evergreen. Use the hashtag #AfterEvergreen on Twitter, Instagram, and wherever else you’re sharing your good news. Diane Hucks Berger, Clinton, a writer and teacher of Buddhist meditation, spent 15 years creating and running The Kilung Foundation, a nonprofit supporting Buddhist teaching and humanitarian work in Tibet. David Michael, Port Townsend, has produced 24 CDs of original music, mostly released on his label, Purnima Productions. He recently performed with Grammy Award-winning woodwind player Nancy Rumbel at a world-fusion concert. Pat Graney, Seattle, is Crosscut’s 2017 Courage Award for Culture winner. Pat’s Keeping the Faith/The Prison Project introduces incarcerated women to dance, writing, visual arts, and sign language, culminating in a performance. View her 2016 Evergreen Art Lecture Series about the project on Youtube. Bishop Leo C. Brown, Jr., Tacoma, is founder and senior pastor of Tacoma’s True Vine Community Church of God in Christ. An avid fisherman in his spare time, he has served the church for more than 40 years. Carol Ann Clark, Merritt Island, Fla., retired from 32 years with the National Park Service, serving as park superintendent in many states. She is on the board of directors for Conservation Volunteer International. She and her husband Michael spend their time traveling the world and enjoying the upper peninsula of Michigan. James Lewicki, Fort Collins, Colo., is director of the Pagosa Peak Open School. Previously, he was the executive director of the Academy of Arts and Knowledge, a teacher for 17 years, YMCA camp and program director, and National Outdoor Leadership School instructor. Keith Eisner, Olympia, is joyfully retired, teaching writing classes at the Olympia Senior Center. His story, “Blue Dot,” about a young couple on a drug trip who discover truths far stranger than their hallucinations, was published in The O. Henry Prize Stories anthology (Anchor Books 2017). Stephen Paige & Susann (Adams) Paige ’85, Tucson, Ariz., tell us they “Met at Evergreen in 1982 and have been happily together since!” Ambassadors for Allegro Coffee Company for 40 years, they travel the country in their ’51 Flxible bus, sourcing organic coffees. Avid mountain bikers, they’ve crossed the country by bicycle four times. Gretchen Lister, Lawrence, Kan., is outreach coordinator with the Willow Domestic Violence Center. She earned a master’s in social work from the University of Kansas and has worked for various school districts, hospitals, and other community organizations. Joan McKinsey, Effort, Pa., is recruitment specialist with Devereux Pocono. She served on the Polk Township tree lighting committee; Polk Township Veterans/Memorial Day committee; Pennsylvania Ombudsman; AAUW “Rising Star,” and Salem-St. Paul Church Council Vice President. Brett Redfearn, Rye, N.Y., was named director of the Securities and Exchange Commission’s division of trading and markets. Before joining the SEC, Brett was global head of market structure for the Corporate and Investment Bank at J.P. Morgan, and served on the boards of Bats Global Markets, the Chicago Stock Exchange, BIDS Trading, and the National Organization of Investment Professionals. Melanie Best, New York, N.Y., graduated with honors from Brooklyn College with a MFA in poetry in 2017. Monty VanderMay, Santa Fe, N.M., a retired trial attorney, set the record for hammer throw while at Evergreen in 1988. Now eligible for the Senior Olympics, he recently won the Gold Medal in the National Senior Games in Birmingham, Alabama for men age 50-54. Helen Nahoopii, Waimea, Hawaii, opened Indigo Blue Hawaii, providing quality, affordable home goods and clothing made from natural dyes on cotton, silk, hemp, and linen, with proceeds going to a local food pantry. She first learned about the indigo dye technique of shibori at Evergreen, “I was drawn to the Japanese sense of design and simplicity,” she says. Tree Moment I, 2017, Oil on canvas by Tamara English ̛91. Tamara English, Portland, is a full-time painter whose oil paintings have been exhibited nationally and abroad since 2003. Her work is currently represented by galleries in Essex, Connecticut, Chicago, Scarsdale, New York, Portland, and London. In January of 2018 her work was featured in an exhibit at the Seattle Art Museum. Kelly J. Gallagher, Albuquerque, N.M., earned her Ph.D. in nursing from the Univ. of North Dakota. She is director of nurse-midwifery services at the University of New Mexico Hospital. At Evergreen, she worked at the Women’s Health Center and studied philosophy. Onik’a Gilliam, Seattle, joined the education and employment practice at Helsell Fetterman. Onik’a has practiced in Washington for seven years, following a move from St. Thomas, V.I., where she practiced civil litigation. She also served as staff attorney to the United States Court of Appeals for the Ninth Circuit and for Berkeley’s Office of the City Attorney. Haws ̛92 in Harlequin ̛s Laughter on the 23rd Floor. Jason Haws, Olympia, an award-winning actor, teaches drama and social studies at Marshall Middle School. In 2017, he directed Shrek the Musical Jr.
at Marshall and starred in August: Osage County and The Understudy. Jason is also workshop director for Creative Theater Experience, Olympia’s longest-running youth summer theater program. Alex Lubin, Albuquerque, N.M., is interim associate provost for faculty development at the University of New Mexico. Currently a full professor of American studies, he served as director of the Center for American Studies and Research at the American University of Beirut, where he designed and launched the region’s first master’s program in transnational American studies. Elizabeth Dinkins, Louisville, Ky., is interim dean for the School of Education at Bellarmine University. Previously associate dean and associate professor of literacy education, chair of the doctoral program in education and social change, assistant professor of graduate education at Georgetown College, and an instructor at the University of Virginia (UV), she received her doctorate in English education from UV and her master’s in education from Vanderbilt University. David Marshall, Milton-Freewater, Ore., was named human resources director for Hermiston School District. Previously assistant superintendent for the Milton-Freewater School District, he also served as principal for Ferndale Elementary School, computer teacher at McLoughlin High School, and adjunct instructor for Blue Mountain Community College and Lewis and Clark College, and at an American community school in Egham in the United Kingdom. Kelly Kaczynski ̛s ( ̛95), And (Elijah’s foot), detail. Kelly Kaczynski, Chicago, Ill., is an artist working in the language of sculpture, and a lecturer with the School of the Art Institute, Chicago. She earned her MFA from Bard College, and taught with Northwestern Univ., Univ. of Chicago, Univ. of Illinois, Univ. of Pennsylvania, and the School of the Museum of Fine Arts, Boston. Sylvia Anderson, Everett, CEO of the Everett Gospel Mission, was awarded the Bethany of the Northwest Foundation’s Raili M. Hanson Inspirational Award. She co-chaired the Everett Community Streets Initiative task force & worked for Big Brothers Big Sisters of Pierce County. Elizabeth Paul, Arlington, Va., teaches writing at George Mason University in the D.C. area. She published her debut chapbook, Reading Girl (Finishing Line Press), a collection of prose and poetry exploring the paintings of French post-impressionist Henri Matisse. Erin Herda MiT ʼ06 (center) with friends at 2017ʼs Courageous Conversation. Chelsea L. Thomas Altrum MiT ’06, Olympia, teaches at Timberline High and was awarded 2017 Teacher of the Year from the North Thurston Teachers Association (NTTA). Carl Fred Ericson MiT, Tumwater, teaches at River Ridge High and was awarded 2017 Teacher of the Year by the NTTA. Richard Myers, Portland, is a partner in the law firm of Bennett, Hartman, Morris & Kaplan, representing individuals and labor unions in civil litigation. Delia Dunlapʼs Margaret Aya Rose with her Geoduck! Delia Dunlap MiT, Silver Spring, Md., teaches ESOL and U.S. History at a high school for new immigrants. She is a proud Greener and credits MiT with giving her a strong foundation for teaching. Delia and her partner Courtney recently welcomed future Geoduck Margaret Aya Rose to their family. Ted Cohn MiT, Shelton, teaches English Language Arts and can be seen shaking for a good cause in Olympic Middle School’s The Great ShakeOut! 2017 video on Youtube. Michael Parker, Steilacoom, is enjoying an outstanding professional basketball career in Japan playing for the Chiba Jets Funabashi. He added to the legacy that began on the Geoduck’s basketball team in October 2017 when he surpassed the 10,000-point milestone. “Coming from a small school and coming here on an expansion [basketball Japan league] team I’m just happy that I was able to play with the biggest teams and now I am on one of the best and most followed teams in Japan,” he recently told Japan Times. Shelli Slaughter, Olympia, is director of Thurston County Public Health and Social Services. She formerly served as executive director of the Family Support Center in Olympia. Kathleen L. Agren MiT ‘07, Olympia, teaches at Chinook Middle School and was awarded 2017 Teacher of the Year from the North Thurston Teachers Association. Sean Riley MiT, Seattle, is a teacher at West Seattle High who strives “to create inclusive, authentic, democratic, and unforgettable learning experiences… to engage young minds.” He also likes to crack corny jokes. His articles and blogposts about issues facing educators have been published in The Stranger and the Seattle Times. Renata Rollins, Olympia, was elected to serve on the Olympia City Council beginning January 2018. Sam Costello, Olympia, is public information officer for the Olympia Police Department (OPD). He started in 1998 as patrol officer, was promoted to sergeant in 2011, and to lieutenant in 2016. He manages the OPD Special Operations Division. Capt. Phillip D. Holt, Kailua, Hawaii, serves as operations officer for the 322nd Civil Affairs Brigades near Honolulu. He previously served in Iraq, Afghanistan, Kuwait, and Jordan. His first novel, Violence of Action: A Mercenary Tale was published in 2017. Teresa Mosqueda MPA, Seattle, is a lobbyist for the Children’s Alliance and the Wash. State Labor Council, AFL-CIO. She was recently elected Seattle City Council Member. She has fought for healthcare, minimum wage increases, and comprehensive paid leave legislation. Jennifer Newton MiT, Portland, teaches English Language Arts at Penrose High School. Rashad Norris MPA, Tacoma, is director of community engagement for Highline College, where he started the Annual Black and Brown Male Summit and Y.E.L.L. Female Summit to encourage empowerment and self-advocacy among students of color. Jen Ryle, Olympia, artistic director of Olympia Family Theater, also directs many productions at Lincoln Elementary and serves as choir director. William J. Marchand, Omak, has worked with the Colville Tribes since 2013, first as transportation planner, and then as planning director. He has held positions in the U.S. Senate, the Department of Homeland Security, and the Bureau of Indian Affairs. Joshua Parker MiT, Olympia, an instructional specialist for the North Thurston Public Schools, presented at TVW’s Celebrating Civics event (tvw.org/celebrating-civics). Karama Blackhorn, Olympia, was awarded the 2017 Woman of Achievement award by the YWCA of Olympia. She’s a first-generation student pursuing her MPA at Evergreen while serving as an academic and career advisor. Sarah Curtis, Puyallup, is manager of Yelm Farmers Market. She previously served as assistant manager at Pierce County’s largest market in Puyallup. Rand Hodgson MiT, Olympia, was named Evergreen’s Distinguished Educator for 2017. Erin Tinney, Shelton, an in-home health care nurse, married Matt Crichton in August 2017. Amy Solomon-Minarchi MiT, Olympia, held pop-up performances during Arts Walk last fall as part of her work as the Olympia’s first appointed poet laurate. Amy is curating an anthology of poetry entitled I Hear Olympia Singing. “There’s so much to be captured,” she told The Olympian. “Olympia is in such a cool and weird evolutionary state.” She teaches literature and creative writing at North Thurston High. Anthony Martinelli, Des Moines, is communications director for Sensible Washington—dedicated to reformation of the state’s drug laws. Simeon Roth, Seattle, earned his doctorate in pharmacy from the University of Washington. He has accepted an offer to co-own and manage an independent pharmacy, Natural Care Pharmacy, in a rural town near Monroe. Nathan Valentine, Montesano, earned his master’s in nursing at Yale University and is a nurse practitioner with Family Medicine of Grays Harbor in Aberdeen. Dannie Parke MiT ’15 with students. Photo by OSD. Dannie Parke MiT ’15, Olympia, teaches at Lincoln Elementary School in Olympia. Matthew Ramirez, Washington, D.C., is a legislative correspondent for Nancy Pelosi, handling various legislative issues, including immigration and government reform. He’s worked with U.S. Sen. Patty Murray, and Congressman Ted Lieu. His research helped in the drafting of H.R.1437, the No Money Bail Act of 2017. He enjoys mentoring youth, travel, and weightlifting. Kent Johnson MIT, Molly Davidson MiT BA ’15, and Becca Wylie de Echeverra MiT, joined the alumni panel for New-Student Orientation, providing advice to Evergreen’s 2016 cohort of MiT students.